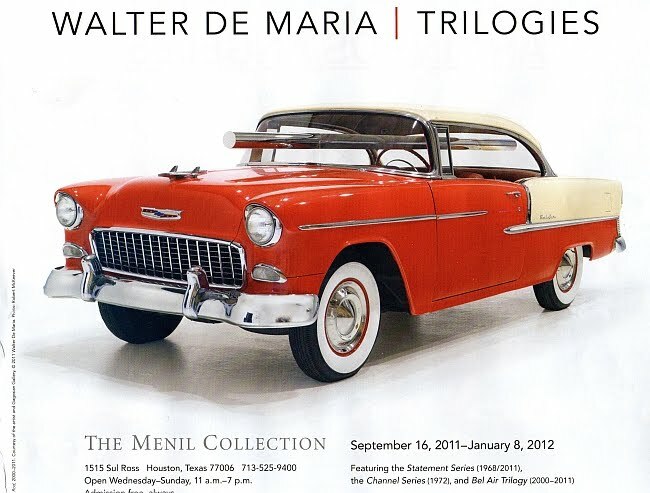 There is a strange exhibit of work by Walter de Maria up at the Menil Museum. De Maria is most famous for Lightning Field, a major piece of land art in New Mexico consisting of 400 stainless steel poles, arrayed in a 1 kilometer by 1 mile grid. The idea is that they would be frequently struck by lightning, but it turns out that lightning is not actually all that common where De Maria built Lightning Field. This ironic non-functioning quality is also present in the three paintings in the show, the Statement Series. This consists of three enormous monochromatic paintings--red, yellow and blue--each with a stainless steel plaque in the middle. Each one has a gnomic statement engraved on it: "The color men choose when they attack the Earth" on the yellow, "NO WAR NO" on the red painting, and "YES PEACE YES" on the blue. The latter two seem utterly trite, while the first at least has some mystery to it. Collectively, they fail on all fronts. As personal expression, they seem simplistic and impersonal. As activism, they are utterly ineffectual. As argument, they are non-existent. Far from being powerful statements against war, they come across as pompous self-indulgences. Like a mammoth sculpture designed to be struck by lightning being placed in a location relatively devoid of lightning, these paintings are futile. The second three-part piece, The Channel Series, is pretty enough--more stainless steel. Three shapes on the floor, a square, a circle and a triangle, made out of steel channel in which is a steel sphere which cozily fits into the groove of each. They look like they could be a game or part of a giant pinball machine. Their scale was relatively modest. Which made it hard for them to compete with the Bel Air Trilogy--three cherry 1955 Chevy Bel Airs, each with a metal beam stuck through the front and rear windshields. The description makes one think of violence, like a car that has somehow run into a pole and gotten itself impaled. But that's not what you see when you got there, really. The stainless steel poles don't appear like they were rammed violently through the car--they seem, in contrast, to almost be floating. The effect is curiously magical. Is Bel Air Trilogy self-indulgent? Absolutely. But it is beautiful to look at. Of course, most of that beauty comes from seeing these fantastic old cars. But the suspended steel beams add an otherworldliness to them. The sheer strangeness of it makes it all the more beautiful.